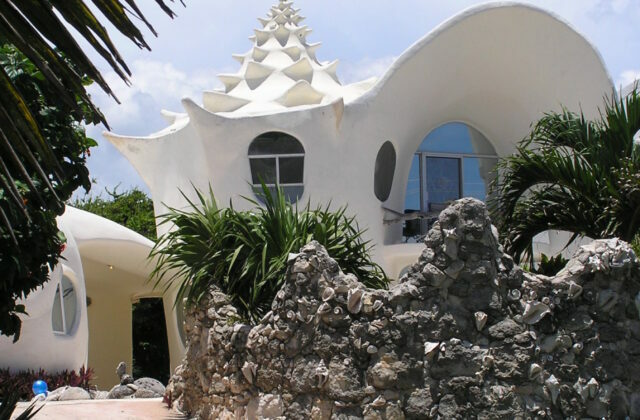 There is nothing quite like the curb appeal of this Isla Mujeres home built in the shape of a giant conch shell. Most vacationers arrive in Isla Mujeres after embarking on a 25-minute ferry ride from Cancun. This eight-mile-long island plays host to a home whose exterior is unusual enough to make you think, “Is that for real?” If you’re interested, it’s possible to rent this one-of-a-kind getaway facing the Caribbean Sea. Not only is this structure architecturally eye-catching, it’s also environmentally friendly. The two-bedroom home, built in 1997, is made from recycled concrete and found materials. One of the main forms of transportation in quaint Isla Mujeres is via golf cart. On any given day, it’s at least 50-50 that you’ll find a golf cart parked on the road outside the shell house. Travel Dreams thinks you’ll agree that this conch-shaped retreat is a photo opportunity that is hard to resist.